Gulammohammed Sheikh (b. 1937) is an artist, writer and educationist. For over five decades he has pioneered an engagement with historical forbears and a social and political investment in art practice. As a teacher of art history and painting at the M.S. 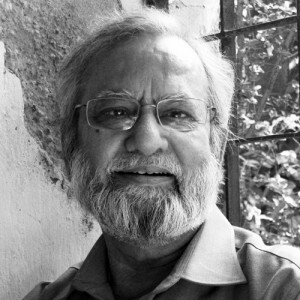 University of Baroda, and through numerous residencies and publications, he has contributed to a renewed understanding of cross-cultural themes in artistic pedagogy, in an Indian and international context. His major works include a mural in the Legislative Assembly in Bhopal, paintings dealing with poetry of the sixteenth century poet Kabir, a number of painted and digital books in accordion format and painted ‘Shrines’ made of wooden boxes with multiple doors. The mural refers to India’s past and present through stories of good governance to environmental disasters like Union Carbide. Books and shrines open in multiple directions for the viewer to enter and intervene in the narrative portrayed. Using linguistic parameters of traditional Indian and Sienese painting in a contemporary context, he has sought to evolve a personal vocabulary for our times. Sheikh has been Visiting Faculty at the Art Institute of Chicago (1987 and 2002) and Visiting Fellow at Delhi University (2004). He has held residencies at Montalvo, California (2005), the University of Pennsylvania (2000) and the Civitella Ranieri Center, Umbertide, Italy (1998). Athawa, a collection of his poems, was published in 1974. He has written widely on art and aesthetics. At the National Gallery of Modern Art, New Delhi, he co-curated Birth and Life of Modernity (1989), consisting of selections from French museums and in 2006-07, a centenary retrospective of the artist Benodebehari Mukherjee. In 2002, he curated New Art from India: Home, Street, Shrine, Bazaar, Museum, for the City Art Gallery, Manchester, U.K.
His solo exhibitions include Mappings (2004); Palimpsest (2001); Kahat Kabir (1998); Pathvipath (1991). A retrospective of work from 1968-85, Returning Home, was held at the Centre Georges Pompidou, Paris in 1985. His work has been shown in numerous group exhibitions of Indian art. These include, most recently, Chalo India, A New Era of Indian Art, Mori Art Museum, Tokyo (2008), Seoul, Korea, (2009); Horn Please: Narratives in Contemporary Indian Art, Kunstmuseum, Bern (2007) and New Narratives: Contemporary Art from India, Chicago Cultural Center, Chicago (2007); Edge of Desire, curated by Chaitanya Sambrani, shown at New York, Mexico City and Berkeley, California (2005) and Perth, Australia (2004).